If you ever wanted to taste the experience that every Mac user has when navigating the web, then here's your chance! Enjoy the silver finish of every button and the panoramic view of the dashboard (top sites) and history screen. Well, except for the title bar buttons of course. Unfortunately you will not be able to zoom the window, just maximize it. Safari is presenting itself as a modern browser. Although not noticeable at first, Safari does use tabs, it's just that the tab bar is not visible by default. Still, once you open a link in a new tab (by the contextual menu or Ctrl+Click) you get the standard browser look. Regarding tabs however, the tab bar itself along with the new tab button are surprisingly small. It gives the impression that Apple added tabs as an afterthought, thinking that they won't be used very often. Well, I don't know about Mac users but I must be really not myself to stay on only one tab for the duration of my session (which usually lasts for 8 hours). Now that I've got that rant out of the way, let's focus on what Safari does right. Browsing through the options you will see that everything's there. The dashboard is called "Top Sites" and looks like a cinema theater. History and Bookmarks both look like iTunes albums. Of course, we should expect some brand uniformity but I find this a bit unnecessary. On a lighter note, one feature I really like! It's called "Reading List". Often times I stumble upon interesting pages but don't have time or disposition to read them thoroughly. In this case I usually add them to my bookmark toolbar. You can imagine that my toolbar could easily stretch over several monitors, so that's not exactly the best solution for something I want to find later. Reading list works somewhat like a cross between Favorites and e-mail. You can select current pages to be added to the list at anytime. When you want to check back with something you just open the list where every link is presented with some information like an e-mail message. Clicking on one will open the page in question and mark it as read. Just brilliant! Another practical aspect is that Safari actually addresses my bookmarks toolbar problem. bookmarks can be organized into folders that open up in a drop-down style. This would totally win me off if it would not be for the compatibility problem. You see, Safari is not exactly what web developers have in mind when building and maintaining internet sites. Facebook for example does not look it's best and YouTube recommends something that's more up to date. That may be an issue if you often hang out there. The YouTube player is especially affected (he buttons are mashed together and it's a real challenge to pause or change the volume). 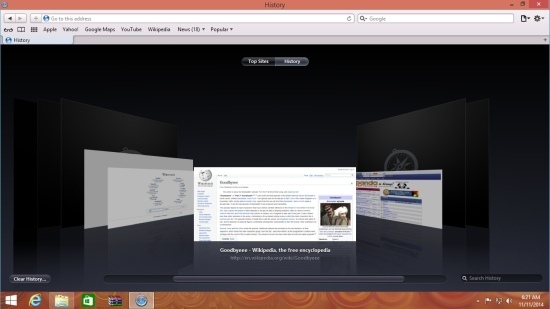 Safari can be enhanced with the help of the most popular add-ons that are available on Chrome and Firefox also. With all due respect, Safari really needs to keep up with coding standards if it wants to gather ground on the browser use pie chart. For all the good parts it has, not being able to control YouTube videos really detracts from it's chances of being used by me. How about you?